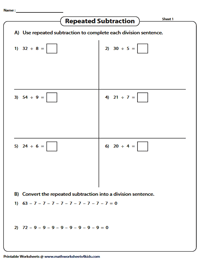 Supplement your core teaching with 50+ basic division worksheets, tailor-made for grade 3 kids to build division skills. Featured here are charts, PDFs to learn the zero property and identity property, single and double digit division, word problems, repeated subtraction, balancing division equations, comparing quantities, finding unit price, coloring, cut and paste activities and much more. Familiarize grade 3 kids with the frequently used terms in division with these visually appealing charts; that vividly define the parts of a division equation and illustrate the step-by-step process involved in division. 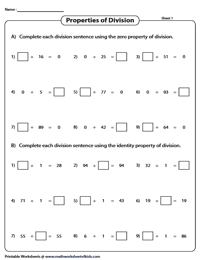 Focusing on the zero property in Part A and the identity property in Part B, the worksheets contain adequate exercises. Plug the missing divisor, dividend or quotient to complete the worksheets. 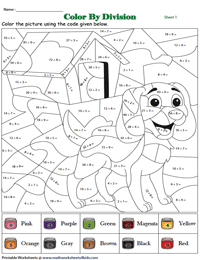 Grab the attention of kids with this batch of attractive worksheets. 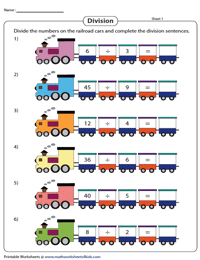 Instruct kids to divide the numbers on the railroad cars and work out the answer to the division sentences. 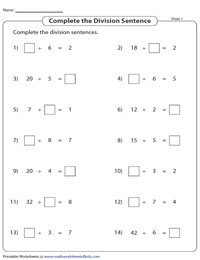 Intensify your practice with this stack of basic division worksheets for beginners, comprising 12 problems involving single-digit and double-digit dividends to be divided by single-digit divisors. 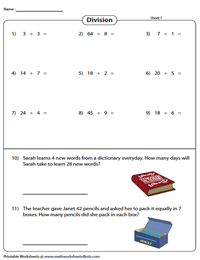 Level up with this set of worksheets consisting of 9 division problems followed by 2 word problems. Read the scenarios carefully and apply division skills to solve the word problems. Learn an important skill in calculating the unit price of objects. The price of the pack is displayed on the tag, count the number of items in the pack, divide and find the unit price. Solve word problems too. Comprehend how division and subtraction are related. Represent the division equation as a series of repeated subtraction to find the quotient in Part A and convert the repeated subtraction to a division sentence in Part B. 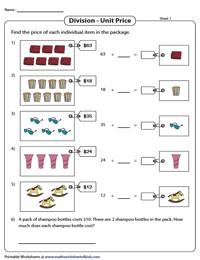 Put your basic division skills to test with this set of PDFs. 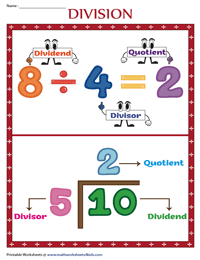 Plug in the dividend, divisor or quotient to complete the division sentences and understand the relationship between multiplication and division in the process. 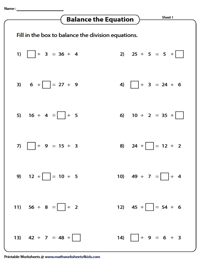 Balance the 14 pairs of division equations in each worksheet presented here. Solve one division equation and using the quotient obtained, figure out the missing dividend or divisor of the other equation. 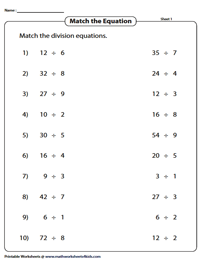 Find the solution to each division problem offered on either side of the worksheets. Match the ones with the same quotient and identify the equivalent pairs of division statements. 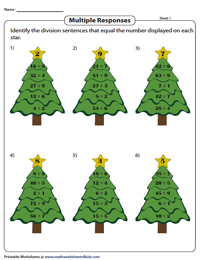 Work out each division equation presented on Xmas trees, on ice cream scoops and on lighthouses. 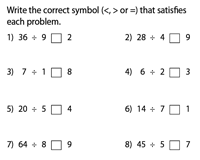 Check the ones whose quotient matches the specified number in these multiple-response-division worksheets. Solve the problems, plug in the correct comparison operator that satisfies the equation. Compare the division equation with the quotient in the easy level and with another equation in the moderate level. The kingfisher, the alligator and the frog are all looking for greater numbers. 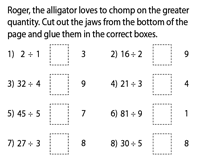 Solve the division sentence(s), snip the comparison operators and glue the one that satisfies the equation in the boxes. 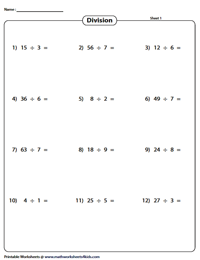 Spark interest in kids with this fun division worksheet pack. Divide the numbers and map the answers to the letters to decode the riddles. 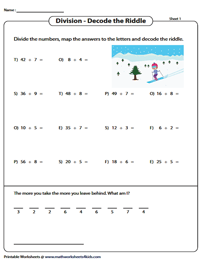 Divide the given numbers, map the quotients with the color code and color the picture accordingly in these two-in-one activity worksheets and bolster division skills on the go. 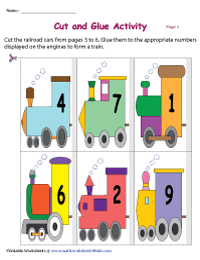 Each railroad car bears a division equation, solve the equation and map the quotient to the appropriate engine. Glue the cars with the same quotient and assemble your little train.